Please keep in mind that flat-panel LCD monitors and TVs have more restrictive viewing angles and a much higher fall-off curve than CRT monitors and TVs, and that the fall-off and view angles vary among different flat monitors, so that a very great difference can be seen between viewing an image seated in front of the monitor vs standing and looking down at it. This page is designed to be viewed with the monitor setting to resolution of 1024 x 768 at 24-bit or higher (true) color. Set your monitors brightness to maximum and then reduce so that the black square on the far right of the bar below is just a true, deep black, just disappearing into the starfield background. Then adjust contrast for a bright white on the far-left square, but below any washout or flaring. While the images on this page are reduced for the Web, they are still of higher resolution than usual for Web publication so that you can have an idea of the image quality to expect. If you have a dial-up connection rather than cable or DSL, it will take some time for all images to load, and you may wish to take a break during this period. The SpaceScapes™ CD set is an almost 1.4-gigabyte compilation of astronomical images on two CDs, many captured by the Hubble Space Telescope, which has rightly seized a monopoly on visible imaging in space. The CD set contains images of extraordinary beauty that you will appreciate for a lifetime; captivating, informative images that are astronomical, of the Earth from orbit, and of other planets that were captured by other government and public-funded observation platforms. 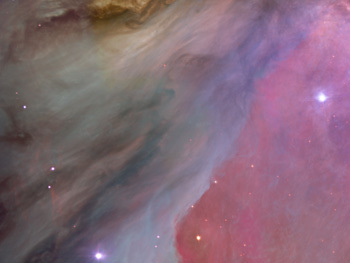 But the Hubble images predominate in their detail and beauty. For the most beautiful images, you will find high-resolution images for printing in addition to the wallpaper and screensaver formatted images, plus, included are select, cropped sections in full-screen and printable sizes that are not available anywhere but on this CD set. Far less expensive than any pair of binoculars or telescope you might buy or give as a gift to a family stargazer, this CD set opens the universe on a Windows-compatible PC or TV screen (through CD-R compatible DVD/Blu-Ray players) as only the advanced, space-based imaging of today can deliver. Can you see God, as the Jokester, casting the Moon man into the heavens in the image? 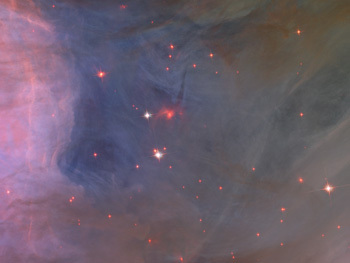 Perhaps Hubbles greatest image, visually, is the one, above, of the fabulous stellar nursery, the Orion Nebula. The CD contains three complete images, one a 960-pixal resolution, a cropped, full-screen 1280-pixel image, and a full-size, high-resolution image. The CD also contains 18 selected sections, made into 1280-pixel closeups, and the best are provided in both JPG and, like many of the best images on CD, in high-resolution, 300-DPI TIFs or HR JPG for printing. These images were created from the massive 394.3MB ultra-high-resolution, original NASA file, and you will be able to zoom-in to see amazing detail, in full-size, on the CDs high-resolution TIF and JPG images. Below are six selections of the 18, sized to 350-pixal width. Further down, the Wolf s Head is part of this group. They make stunning screensavers and wallpapers. Since the last additions to the SpaceScapes� CD set, there has been much observation, and most significant, the final Hubble servicing mission, which installed new, 30-times more powerful cameras, which allow Hubble to look back 13 billion light years, closer than ever before to the Big Bang, and which increase the Hubble�s resolution by 90 percent! Above is a picture set of an astronaut returning the Wide Field Camera 2 (WFC) to the Shuttle after installation of the new, WFC3 was completed. The set is of the original, down-scaled image (left), compared with the edited, enhanced version (right), which is representative of the same improved editing that is exclusively applied to all the major images prepared for inclusion in the SpacScapes� CD set. After the astronauts released the telescope back into its orbit from the shuttle, it underwent three months of alignment and calibration of the instruments. Then, the telescope�s power was focused into space to obtain the first high-resolution images, which are of a group of objects selected to best demonstrate the telescopes new capabilities and improvements. 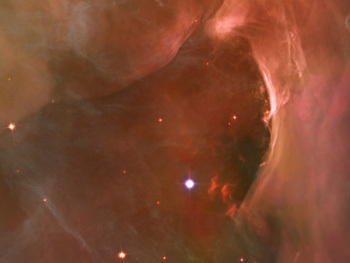 These initial, post-servicing-mission images are called the Early Release Observations (EROs), and the most dramatic of all the ERO images have been included on the discs, and edited in the same way as always, in various crops and resolutions for the most impacting display, to bring the best of the Hubble collection on the discs up to date. New image of the Antenna colliding galaxies, composite from the Chandra X-ray Observatory, Hubble (visible) and the Spitzer (IR) Space Telescope. 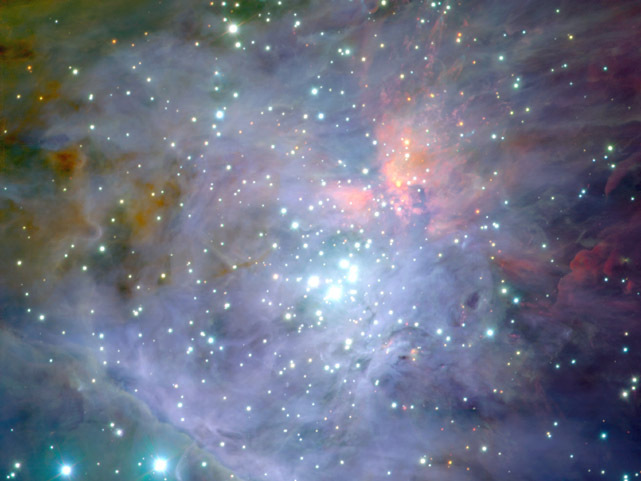 The European Southern Observatory's beautiful images of the Lagoon, Orion, and R Coronae Australis nebule, one of the nearest stellar nurseries. the Atlas 5 launch and spectacular NASA Solar Dynamics Observatory (SDO) First-light image of the full solar disk. the atomic-blast mimicking eruption peak of Kuril Island's Sarychev Volcano. International Space Station configuration chart and new images with latest construction and a Flash-animated construction sequence. the spectacular, post-service-mission four (final servicing mission) Early Release Observations (EROs) added October 2009.
a spiral galaxy, 50,000 LY distant, with a massive black hole at its core, creating a ring of new-forming stars poised to fall into the monster. a collection of visible-light and composite images of the beautiful, stellar-nursery cloud Cepheus B, located 2,365 light years away. 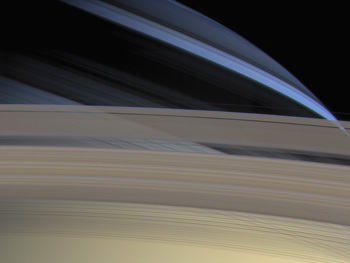 the best of the Cassini mission's images of the Saturn system's bold geometry and stark beauty. Hubble�s best image of spiral galaxy M81, reproduced from the massive 700+MB file, in various screen sizes and with real-size close-up crops. new overlay mapping of mysterious dark matter, which is now known to account for most of the mass in the universe. the recent, first-ever, high-resolution video (framecaps) pictures of Earthrise and Earthset from Japan's (JAXA) lunar satellite. a dwarf galaxy where stellar �fireworks� are going off all the time and hundreds of thousands of vibrant blue and red stars blaze. beautiful, Earth images of Bear Glacier, Alaska, and the Sundarbans in Bangladesh. beautifully detailed images of Shuttle Endeavor in orbit with Earth backgrounds, from the May 2007 mission. a spectacular image of the whole of Florida (except the western handle) and South Georgia, showing the recent Bugaboo Fires. a cloudless, unobstructed image of the entire lovely green of Ireland. truly spectacular North-and-Central-American and whole-Earth images of Hurricane Dean. a gorgeous Kitt-Observatory image of comet Neat against an unblurred, unstreaked, starry background. an overhead view (shown below in reduced size) of the wind-sculpted Noctis Labyrinthus region, on Mars. Below are six sample images (one a 4-set composite) of the full-size, edited Hubble ERO image releases that are included in the CD set, beginning with NGC 6302, the remnant of a supernova, named the Butterfly Nebula, the full view and a close-up, both of which are provided in 1280-wide high-resolution. Above (left) is barred spiral galaxy NGC 6217, six-million LY distant, beautifully revealed by Hubble’s new instruments. On the right is the familiar stellar-nursery tower of the Carina Nebula, revealed in visible light. Jets of material, moving at 850,000 mph, ejected from new stars are clearly visible. As new, qualifying images are released, they will continue to be edited and added to the set. The portrait of Stephan's Quintet, also known as Hickson Compact Group 92 (top left), was taken by the new Wide Field Camera 3 (WFC3) aboard NASA's Hubble Space Telescope as part of the ERO group. 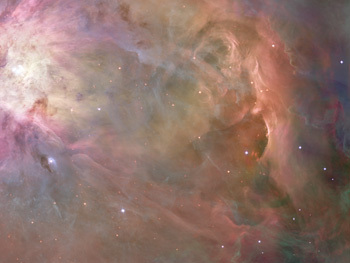 Only the full image of the group (top left), oriented vertically (90-degrees right from the presentation here and on the discs), is provided by Hubble. The horizontal (landscape) view provided here and on the discs allows for a larger, more detailed image, and orientation as it is seen from Earth is not really important, unless you're navigationg there. You will have to take this orientation change into account when reading the accompanying science data on the disc's associated text file. As is done with many of Hubble's objects, the massive original image has been dissected for this disc set to provide separate, 1280-pixal images of of each object of visual interest, as seen in the examples above of Stephen's Quintet. The name, "Stephan's Quintet," is a misnomer, because group member NGC 7320 (the bluish, dwarf spiral at upper left) is actually a foreground galaxy about 40 million LY from Earth, while the other four galaxies are about seven times farther at 290 million LY away. Three of the galaxies (the pair above) are colliding and as a result have distorted shapes, elongated spiral arms, and long, gaseous tidal tails containing myriad star clusters, proof of their close encounters. The galaxy above, left, will join the pair above right in the distant future. NGC 7319 (top left in both upper pictures and isolated, above right) is a barred spiral with distinct spiral arms that follow nearly 180 degrees back to the bar. The blue specks in the spiral arm at the top of NGC 7319 and the red dots just above and to the right of the core are clearly visible in the 1280 resolution on the disc set, and they are clusters of many thousands of stars. Most of the quintet, except NGC7320, is too far away for even Hubble to resolve individual stars. NGC 7318A and NGC 7318B are the colliding pair of galaxies to the right of NGC7319 in the top pictures, isolated above, right. NGC7317 (top-left picture, bottom right) is a normal elliptical galaxy. 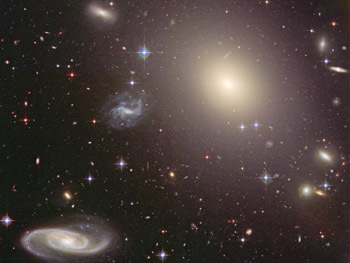 Finally (above), among Hubble�s ERO images, is the Abell 370 galaxy cluster (five-billion LY distant), which very clearly exhibits the phenomenon of gravitational lensing (right edge, above center), which is apparent in a visual streaking, or elongation of objects (galaxies) more distant than the galaxy cluster as the gravity of the cluster bends the light of the background object, distorting it. It is worth noting that not a single object or spec of light visible in the image is a star. Every object seen is a galaxy, which, in an image only a little over two arcminutes wide, provides a perspective on not only the incomprehensible size, but the vast population of the universe. Hubble has shown us that even if the number of intelligent civilizations proposed by the Drake equation were true, if they were all randomly spaced throughout the universe, the life-spans of their suns, and ours, would not nearly be long enough for the radio signals of any one to ever reach any other. Using the petri-dish postulation, if the universe is a vast God-created laboratory, the experiments (like Earth) could be expansive while still being more than amply separated by space and time to prevent any possibility, ever, of contamination (ET visit or EM reception). 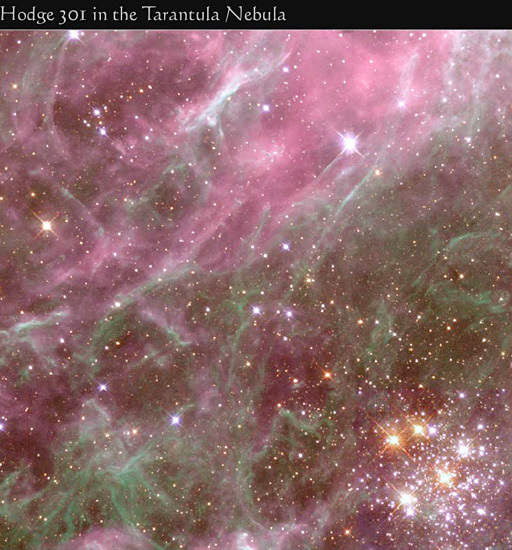 The Tarantula Nebula (also known as 30 Doradus or as NGC 2070) is located 168,000 light-years away in the Large Magellanic Cloud. In Tarantula, the full spectrum of stellar dynamics is at work, with stars beginning and ending their lives with spectacular effect. Exploding supernovae from older stars in the Hodge 301 star cluster, located below and to the right of the area seen above, are sending shock waves into the nebula, forming the green and white filaments and veils of gas that make the Tarantula so beautiful. The last Hodge 301 supernova lit the region in 1987. Hodge 301, looking like diamonds and rubies strewn in the light of the sun, is one of the most explosive regions in our Milky Way galaxys local group, with three of its golden supergiant stars poised to erupt and, like the 1987 supernova, seed the nebula with their gases and heavy elements. 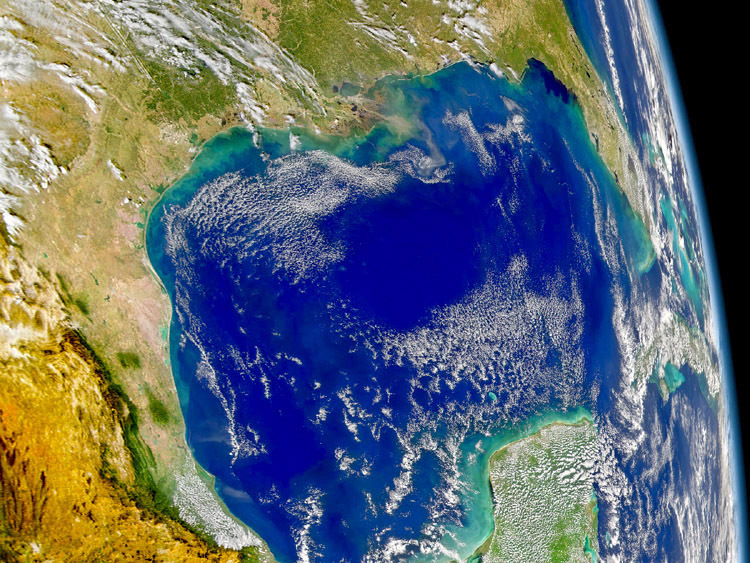 The beautiful image of the Gulf of Mexico coastline, above, is only one of the more than 270 images in the "Earth" folder, reduced, here, from its 1800x1350 resolution on the CD. In many cases, several close-up crops in full-screen size are also included with the full images. The Earth folder also contains launch-pad, satellite (below), shuttle, and ISS imagery, and among its hundreds of images are many examples of geological formations, global weather, including the best images of some major storms, like Katrina, the recent, first-ever, high-resolution video (framecaps) pictures of Earthrise and Earthset from Japans (JAXA) lunar satellite, the spectacular pair of whole-Earth images, called the Blue Marbles, which are composites of groupings of the best satellite images available, painstakingly combined to depict the globes environmental and land-sea, bio-diverse visual dynamic—a singular, benign home for humanity, at risk from man-made carbon emissions, worth protecting and preserving at any cost. These two Blue Marble images are provided, enhanced, in full resolution (about 3MB each—3718 sq. pixals) and in 1280-square size for wallpaper/screensaver use to fill the largest screen. The images above are only 256-color GIF files. Imagine the detail in just one hi-res, full-color JPG sphere, filling the screen! And there are tools, like the whole Earth radar topographic map in very large size, allowing individual continents to be cropped out for selective uses. The Small World series of images are wonderful illustrations on the perspective of Earths size in comparison to the rest of the Milky Ways objects. Not on the CD, but provided in this link, is a wonderful perspective tool on the scale of distance to the nearest star and beyond. The collection and quality editing of these images took hundreds of hours over more than a decade, and for many of the images, an artists eye was applied to creating sectional images of the most beautiful segments of the entire object depicted. Where possible, the largest original image obtainable was used to create the series of wallpapers, screensavers, and segments, which resulted in often working with images as large as 400 hundred megabytes and more. The result is that youll be seeing these objects in popular screen sizes with the greatest clarity and color saturation possible on a computer or TV screen. A few of the images even have the property of apparent motion (without any influence of alcohol or drugs) when looked at on a computer monitor, though they are static JPG images. And yes, you can also view the images on your TV with a compatible DVD player. 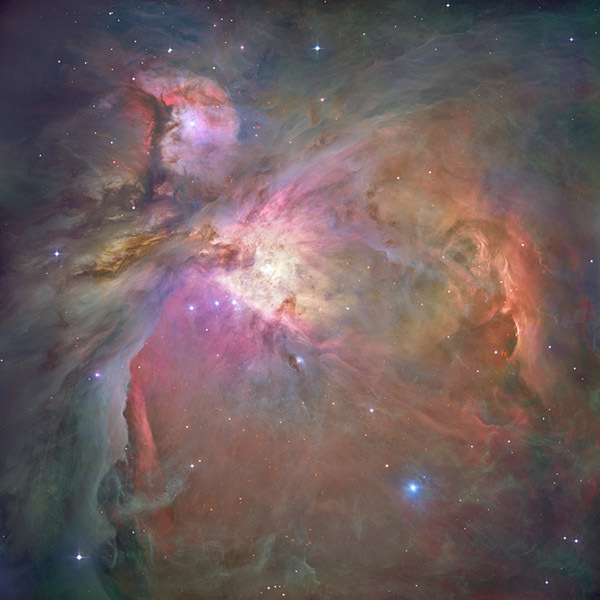 And for those images which are especially significant, like the Hubble deep-sky surveys, and which are supplied in original TIFF format, youll also be able to make beautiful, large prints. 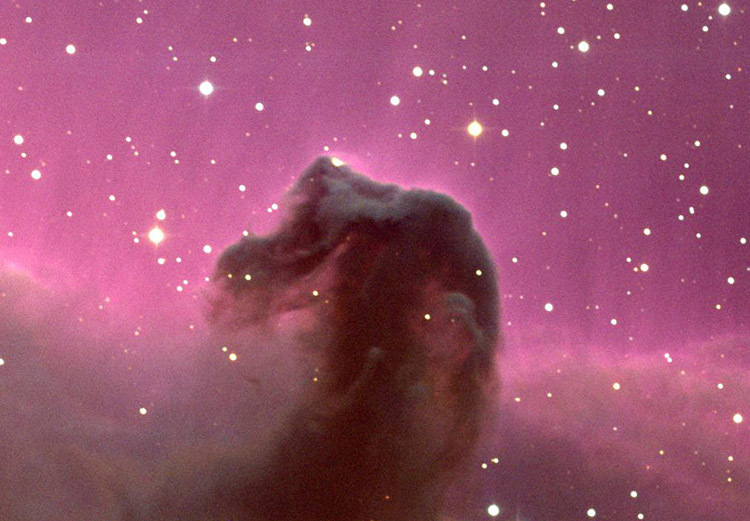 Kitt Peak image of the Horsehead Nebula (reduced)—one of two viewpoints on CD, Hubbles is the other. Ancient civilizations, and some cultures today, believe that the heavens foretell events for man. Like looking at cloud pictures in the sky, except with scales and distances so vast that they last lifetimes, many celestial objects appear as Earthly things, like the familiar Horsehead Nebula. But there are others that are only revealed for the first time, here, below, and in the CD, like a rocket shot aimed at the shrouded head of Osama bin Laden, which resides in the Orion Helix. What message would this image relay on Gods view of radical Islam? The rocket shot is, actually, material from a protostar that is being blown off by the strong stellar wind of a young, nearby star that is out of the frame, here, but which you will see in the larger images on the CD. Finding these metaphoric (spiritual? prophetical?) space-cloud images is accomplished by searching for, finding, and then looking, close-up, at every segment of the very large images that are returned by science’s most advanced telescopes, and the SpaceScapes™ CD is, in significant part, a product of such tedious observations. 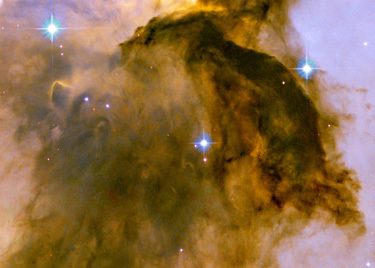 Below is the Wolfs Head (with a paw print doubling as an ear), in Orion , and the Lions Head, found in the Eagle Nebula. What meaning might these symbolic images hold, and how many more can you spot? These objects, including Orions Man in the Moon and bin Ladin, were first spotted and defined for the SpaceScapes™ library and then produced as exclusives for this CD. The CD set contains a variety of 1280-, 1024-, and 800-pixel-wide images to use as wallpapers with various screen sizes. 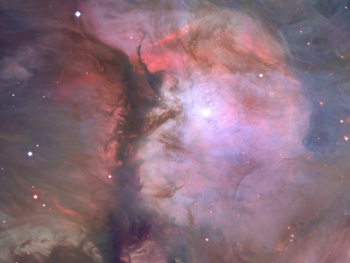 In addition, some of the most significant images ever produced, like the Hubble Deep Sky Survey images (one is below), reaching back almost 14 billion light years, close to the very beginning of the universe, are not only provided in monitor-sized images of the most interesting groups of galaxies of every type, but are also provided in their full-resolution size so you can see for yourself the extraordinary detail of the images: turn up your monitor brightness above the normal gamma zone and zoom in on the dimmest red smudges, glowing in the deep background of creation, and that smudge speaks to you of a galaxy that has no likeness in todays universe of billions upon billions of galaxies, except there, in the feeble light of its distant, primordial past. And, if you have the knowledge, hardware and software capability to do basic cropping and sizing of these large, original images, then you will be able to create your own close-up segments in your screen size to add to those already provided, though I do not believe those provided can be improved upon. If you use 800 X 600, you will be able to down-size those larger images not in that size; although, the later Windows screensaver programs and most third-party programs allow the option of automatically reducing large images to fit the screen so that down-sizing should rarely be necessary, especialy since most of the the large TIFFs provided are accompanied by reduced-sized blow-up images of the most captivating segments, as well as the down-sized full image. 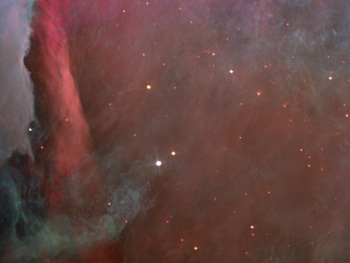 The reduced-size image (above) of the Ultra-Deep Field (UDF is included full-size on the CD) was Hubbles most profound achievement, until the UDF-WFC3 survey (below) that followed the 2009 repair mission. The image above is only a one-quarter section of the, then, deepest survey of the visible universe ever obtained by astronomers. In ground-based telescope images, the section of space portrayed in this image appears mostly empty, but just look at all of the galaxies contained in that small space of sky, visible only to Hubble! There are only three stars from the Milky Way (Earths galaxy) visible in the image. Every other object or speck seen, every one, is a far-distant galaxy, not stars, and the dimmer and more red, the further. The size of the entire survey, as seen when looking up at the sky, is just one-tenth the diameter of the full Moon, which is the same as the amount of sky you would see looking through an eight-inch straw (very small), so this picture, being a 25-percent crop of the full image, is that part of the sky which is seen looking through only one-quarter of the objective diameter of that eight-inch-long straw (very, very small). The image is cropped from a part of the full UDF image which is judged to have the richest diversity and which best reveals the stranded distribution which is a prominent feature of the survey, and which brings to mind the string theory of particle physics, which inhabits the deep mysteries at the opposite end of the quantum scale. 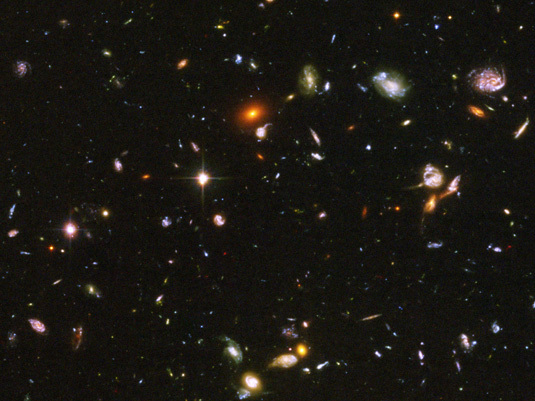 The entire ultra-deep field contains an estimated 10,000 galaxies, and since all parts of the full UDF image have a uniform distribution field, this image has an estimated 2.500 galaxies visible, and with the same result expected at any point of the sky from which Hubble could make a survey, the total number of galaxies in the known universe is truly astounding: billions upon billions, beyond counting. Equally astounding was the technical achievement of the survey, apart from the telescope itself and the Shuttle that launched and serviced it. 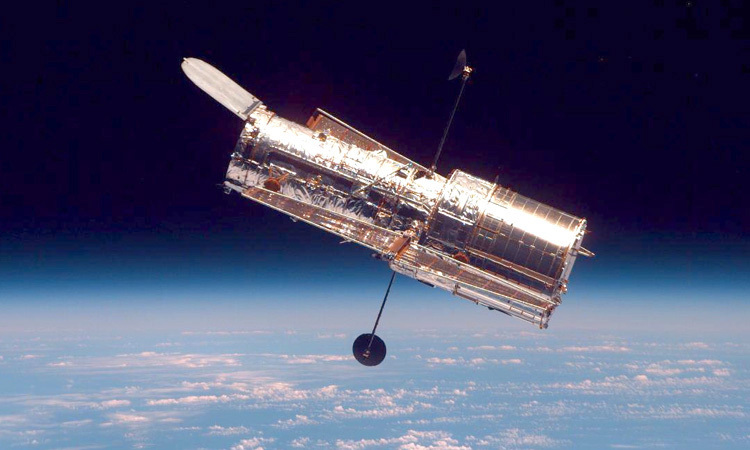 Since Hubble�s ACS camera was required to register light photons that began their long trek across the universe before Earth�s sun existed, those photons, from the dimmest distant objects, arrived at a rate of only one per minute, compared to nearer galaxies with their radiation of millions of photons per minute; so, the survey had to be completed over the course of 400 high-speed orbits, over which distance, a million seconds of precisely aimed observing had to be continuously focused on that tiny speck of space to register enough of those photons to get the image. Now you can appreciate the image all the more, knowing that it is not a montage or special-effects contrivance. This is what each tiny speck of space looks like to eyes powerful enough to see, even the sky that appears entirely empty to Earth-based eyes and telescopes! Imagine how Copernicus, Galileo, Newton, Edwin Hubble, or even Einstein would have reacted if they could have looked into the future to see this image and its astonishing implications! Located in the constellation Fornax, below the constellation Orion, the region reveals the first galaxies to emerge from the so-called dark ages: shortly after the big bang, only 400 million years after the birth of the cosmos. Aside from the multitude of common elliptical and spiral galaxies, the UDF survey reveals colliding galaxies and a uniform spattering of irregular galaxies, which are a visual record of the early time when the ordered structure of the universe was just beginning to evolve. Above is a greatly reduced-scale image of the Great Observatories Origins Deep Survey (GOODS) region, a Hubble composite that required a total of 200 orbits to complete, combining images from the Wide Field Camera 3 (WFC3), newly installed in the late-2009, final-servicing mission, and images from the 2004 Advanced Camera for Surveys (ACS). Among the some 7,500 galaxies which are visible in the image, only about a dozen are scattered stars of the Milky Way, everything else being galaxies, from the faintest, 13-billion-light-years-distant blue and red specs and smudges to the closer, identifiable spiral, barred, globular, and irregular types. The entire sky section captured in the image is only one-third the diameter of the full moon as seen overhead from Eartha very small rectangle of the entire sky. Imagine taking your average binoculars and looking into a part of the night sky where nothing at all is visible but, thanks to Hubble, knowing that a view very much like this, filled with galaxies lies beyond, within that darkness, 250-million times in magnitude below the capability of your vision. And no matter where you look, from anywhere on Earth, in any direction, this cacophony of galaxies is there, some just specs, even to Hubble, but as they were roughly 600 million years after the Big Bang, suspended there in time and space, beyond the visible darkness to behold with the aid of Hubble�s power. While our world and life perspective is curved inward by the gravity of our daily struggles to make us seem predominant in our universe, Hubble pulls our vision outward, showing us a part of the universe�s true, and for us, still-boundless vastness and, in ways impossible for most to really comprehend, how really infinitesimal we are within it, in size, in reach, and in time. Four close-ups (reduced size) from Hubble's GOODS-ERS2 Field image. 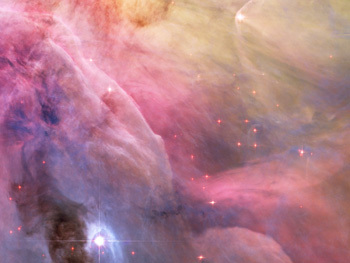 The image, above, of the central area of the Orion Nebulas Trapezium is one of the most beautiful so far found in space. This 640x480 image is reduced from a 2400x1800 section of the full image, which is almost five megabytes, at more than 2700x2700 pixels, and more than 300dpi. Both are included on the CD, along with three other close-up croppings in screensaver and full-resolution size of the most beautiful sections, each edited for best levels, the same level setting that you get using the bright-zone strip at the top of this page. The CD also has five other images of the full M-42 Orion Nebula. The individually edited close-up sections are the only way to fully appreciate the varital colors and shapes, each of which stands on its own merits as a celestial masterpiece. 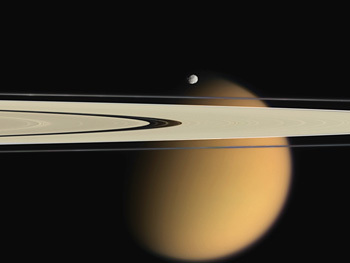 Majestic Saturn, the sixth planet, and for most of the post-Galileo history of man, believed to be the only ringed world of our solar system, until we looked upon Uranus with modern eyes. 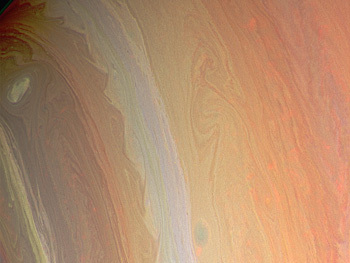 This greatly reduced image of Saturn, and the ones below, are among the best of the Cassini mission's images of the Saturn system's bold geometry and stark beauty which are included in this CD set. 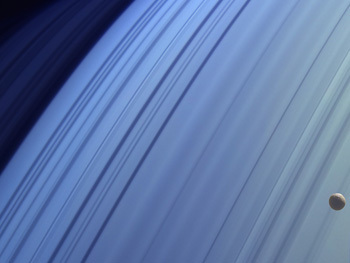 Again, produced from the largest images available, many of the full-screen crops of Saturn, its rings and moons, like those below, are not available anywhere else. Of course, the most recognizable galaxy in the universe, Andromeda (M31, also the closest to us at 2.52 million LY) is included in the set, and it is moving at the incredible speed of 75mi (120km) per second, toward an eventual collision with our Milky Way in about five billion years, when the sun enters its final life cycle. But, this image (above) is the best ever obtained of spiral galaxy M81, which lies 11.6 million LY distant, yet Hubble's image resolves its individual stars. This grand design spiral galaxy is tilted to provide a better view of the spiral structure than Andromeda. 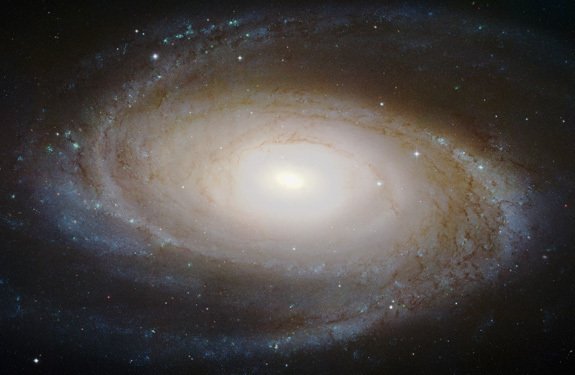 The images of M81 were produced from the massive, 728MB original, and they are sized for various monitor resolutions and include close-ups of the most beautiful clusters and nebula contained within M81's spiral bands, as well as a detailed crop, enhanced for the light values there, of the core, supporting a much larger bulge than the Milky Way's, and containing a massive, 70-solar-mass black hole. 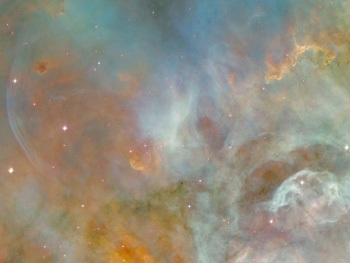 Above is the Hubble-derived mosiac of the central region of the Carina nebula (NGC 3372), located in the Milky Way, 7,500 light-years distant. The image is 50 light-years across, and two versions are provided: a 1280-pixal-wide JPG and a 6000-pixal-wide print version. Cropped sections of the huge mosiac are also provided in dual formats, like the one below (left) of the region to the extreme right, rotated for horizontal capture of the best part of the image in the largest size possible. Above (left) is a crop-out from the Carena mosiac, and (right) is galaxy cluster Abell S0740, 450 million light-years distant. 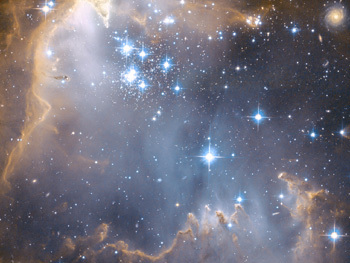 Below (left) is a crop-out from the full image of star cluster NGC602, located in the Small Magellanic Cloud, an irregular dwarf galaxy that is part of the Milky Way's local group, orbiting the Milky Way at 196,000 light-years distant. 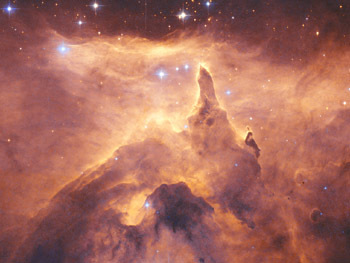 The sea of fire (below, right) is another crop-out from the full-size image of the large emission nebula NGC 6357, located in the constellation Scorpius, 8,000 light-years distant. Imagine the impact of these images filling your screen from edge to edge! Most non-printing JPGs are provided in 1280- or 1024-pixal widths. These thumbnails from the CDs are only about 14 percent of the total image count. The CD set also contains hundreds of images not available in full-screen size, but nonetheless interesting and beautiful. 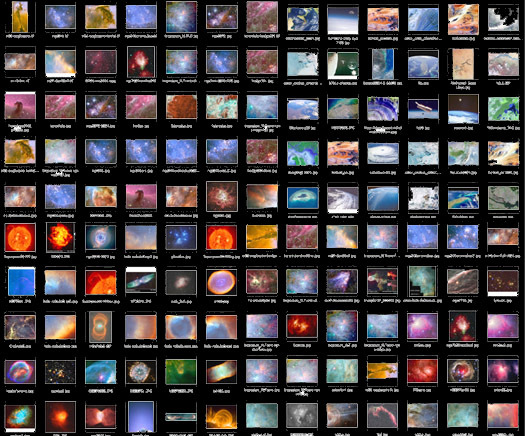 These images are grouped into folders by categories, including Galaxies, Stars, Planets†, and Nebula. Some images were produced with original, high-resolution, massive-sized files that are no longer available in the public space of the original sources and must be requested through forms or registration log-ins. But the emphasis for the CD set is not science, but rather, the beauty or visual impact of the SpaceScapes™ presented. 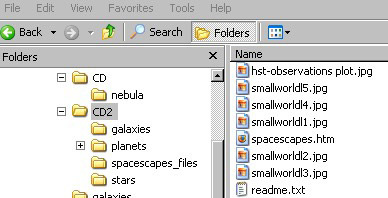 A screen shot of the CDs folder structure. And, finally, but not least important, though the emphasis is not on science, many of the images also have a text file of the same file-prefix name as the image file (with a .txt extension). Double click on it and you will be able to read about the science of the particular, associated image(s). So, the SkyScapes™ CD set also does have a science value as an abbreviated educational cosmopedia of sorts, providing real learning value and answers to some of curiositys questions which arise as the images are appreciated. 2010 is Hubbles 20th anniversary, and while the Bush administrations decision to cancel the last servicing mission cast its future to be as dark as the backdrop of its images, new and captivating vistas are being obtained, as NASA eventually scheduled and successfully completed a final servicing and upgrade mission, in 2009, which will extend Hubbles life and improve its capabilities, hopefully beyond 2014, when its successor, the James Webb Space Telescope is scheduled to be placed into orbit. So, Hubble will continue to observe, recording on science investigations into quasars, stellar evolution, dark matter††, and planetary† systems. While these research objectives are important and invaluable to the advancement of our understanding, they are not subjects that generally yield the most beautiful imagery. But, all such final, visually outstanding images and their variations, to this time, are included on the SpaceScapes™ CD. Its vast treasure of image and perspective can be on your screen in a matter of days by clicking the order button below. The CD set makes a great gift for space kids, too. Order two sets and get $8 off the price of the second CD set. Teachers, e-mail a copy of your current teachers I.D. or teaching certificate (click on the e-mail button or the Silkscape Arts link in the copyright notice, below) and receive a $7 discount on your order. † The International Astronomical Union (IAU), after a long and contentious debate, redefined the definition of a planet, which resolved the issue of Pluto, putting it into the new category of "dwarf planet," and barring admission for the other contenders, which included 2003s discoveries Zena (UB313), EL61, and the Kuiper asteroid belt’s Orcus and the more familiar Ceres, most of which now fall into the new classification of "smaller solar system bodies." It was the last part of the new criteria that doomed Pluto and the others: "A celestial body that is in orbit around the sun, has sufficient mass for its self-gravity to overcome rigid body forces so that it assumes a... nearly round shape, and has cleared the neighborhood around its orbit." So, after 76 years of living in a solar system with nine siblings, the Earth is now part of the sun's larger family of eight. †† Did you know that atoms, the building blocks of everything we see and are, atoms (baryonic matter) are now believed to possibly be no more than only about five percent of the constituent universe? The mysterious dark matter, only very recently proved to exist, is set at about 20 percent, and even more mysterious dark energy is about 75 percent of the universes make-up. It seems that we know little about so little and nothing about so much. and other costs (CDs, CD envelopes, mailers) now at cost of $9.95 per set, not including postage. is shown above) please e-mail to request a plain set. A PayPal invoice for $24.00 will be sent out. Poised on the pad on the dawn of her last flight, Space Shuttle Atlantis is renowned for not only the flight ending the SST program, but also as the vehicle that was assigned to the critical and hugely difficult repair mission to the Hubble Space Telescope, which remains the most ambitious and dangerous shuttle mission in NASA�s history. For a limited time, you can own a piece of the Atlantis legend with the purchase of this beautifully detailed, custom print, the image of which is included in the CD set (but not in large-print size). The made-to-order print measures 13x18� inches and is so remarkably detailed that the stripes on the flag, on the Atlantis fuselage (hardly vivible above), are clearly distinguishable, and a star pattern is even visible in the blue field with a 3X magnifier. If you have your monitor set to the calibration chart at the top, it will appear just as deeply colored and saturated as it does on a professional graphics monitor. 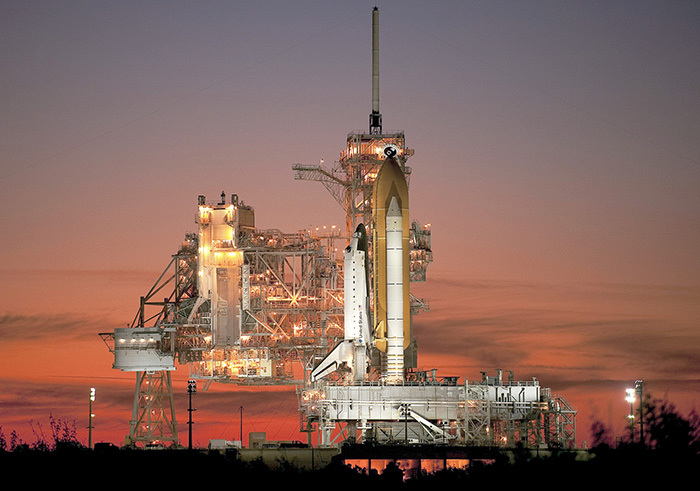 This print is produced with the highest quality inks and paper at the highest resolution of 1440lpi, and when mounted, matted and framed (no glass needed if the environment is not hostile), it will be as proud an icon of the mission and the SST program as hangs in any astronaut�s home or office. When your print order is received (click the PayPal button below to order), you will receive an e-mail acknowledgment with your selected size (click the radial button) digital image (high screen resolution at PhotoShop level 9 @ 96dpi, like the smaller image above) for wallpaper or screensaver use attached, and suggestions and hints that will give you all you need to know to get the print properly mounted and framed, and some technological insights and things to avoid when placing the print for display. The University of Arizona, Caltech, and other publicly funded educational and research sources.